The new Window Warriors TV show premieres on GSN Tuesday, November 15, 2016 at 9:00pm ET/PT. 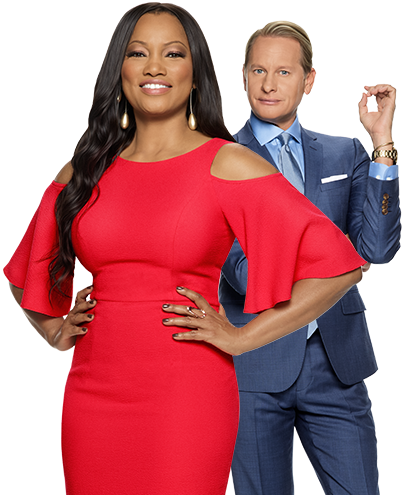 The skill-based competition series is hosted by actress Garcelle Beauvais. Eight window merchandising designers will compete to build elaborate displays and earn the approval of judges Carson Kressley, Tai Beauchamp, and Douglas Little — and a chance at a $100,000 top prize. Get the details from this GSN press release. October 5, 2016, SANTA MONICA, Calif. — GSN, the leader in game shows and competitive entertainment, announced today that many of the biggest names in retail have lined up as promotional partners for the new skill-based competition series WINDOW WARRIORS, hosted by actress Garcelle Beauvais (“Hollywood Today Live,” “Spider-Man: Homecoming”). GSN partnered with General Growth Properties (GGP), the owner and operator of 128 high-quality retail properties throughout the United States, including include Tysons Galleria in Washington D.C., Glendale Galleria in Los Angeles and Water Tower Place in Chicago. Top retail brands, including Macy’s, Anthropologie, Hot Topic, Lush Fresh Handmade Cosmetics and Sprinkles will also serve as partners. Michaels, North America’s largest arts and crafts specialty retailer, also provided many of the materials used to create the windows for the show. WINDOW WARRIORS, premiering Tuesday, November 15 at 9pm ET/PT, lifts the curtain on the intensely competitive and theatrical world of visual merchandising. This new series brings the worlds of art and commerce together as the country’s most talented window designers are challenged to conceive jaw-dropping displays each week. In each episode, the contestants will be given a new theme, correlating with one of these top retail brands and will be competing to stay in the competition, as one person will be sent home each week, until the final top designer remains. Some of the winning windows will also be re-created at specially-selected GGP properties after air. From the festive, to the luxurious, to the shockingly unexpected, these artists must push their creativity to the limits each week, in order to stay in the game and win the $100,000 grand prize. In addition to the cash prize, the winner will receive a career-changing opportunity to design and develop amenities and platforms that elevate the customer experience at GGP properties, the opportunity to design a holiday display at Macy’s New York City flagship Herald Square store and will be featured in design:retail magazine. WINDOW WARRIORS comes from Michael Levitt Productions, the team behind GSN’s most-watched original series ever, SKIN WARS. Executive producers include Michael Levitt (“Skin Wars,” “Kathy Griffin: My Life on the D-List,” “Billboard Music Awards”), Jill Goularte and Liz Cook. Award-winning Visual Merchandising icon Paul Olszewski is consulting producer and Douglas Little, a master in the world of visual merchandising, also serves as a judge and creative consultant for the show. What do you think? Do you like the sound of the new Window Warriors TV series? Do you plan to check out the premiere on GSN? More about: GSN TV shows: canceled or renewed?, Window Warriors, Window Warriors: canceled or renewed? Really looking forward to this show. This is quite an art form in itself and I would love to see how window designers come up with their ideas and execute them. Please give it a chance. I just saw the Sprinkles Cupcake show and loved it!